Alyssa, the creator behind Monticello Soap Company, and I met back in 2009. Upon meeting Alyssa, it was clear she has a passion for serving God in all that she does, and since part of this means "working as unto the Lord", I knew that whatever she put her hand to, she would do so wholeheartedly. I remember hearing about her foray into soap-making a number of years ago, and have been really happy to see her soap business taking off throughout Illinois, Texas, Florida and online. I was so excited when I received my package from Monticello Soap Company! And let me tell you, Alyssa did not disappoint. My husband and I have tried both the Honey Oat and the Lavender soaps, and I'd be hard-pressed to choose a favourite (Andrew's choice is Honey Oat, although I'm not so sure, considering the way he raved about that Lavender soap everytime he had a shower!). Truly though, Andrew says the Honey Oat soap is the best soap he has ever used in his life, and this from a man who is careful about using hyperboles! We both really loved the earthy sweet scent, and the exfoliating ability of the oat pieces. Andrew noted right off that it didn't leave a sticky film like other soaps once you've rinsed them off. The Lavender bar we tried was the smaller size, which would be great as a hand soap, but I loved the scent so much I knew I'd want it in the shower! It smelt just like lavender, which makes for an ultra-relaxing experience. The soap was nice and smooth and really just a joy to use! The SUPER reasonable prices. With natural soaps being all the rage now, it's easy to find overpriced options - but not at Monticello Soap Company! Made with all-natural ingredients, we can use them without worrying about what our skin is absorbing, and happily wash our little guy with them too. The lip balms. I have peppermint and lime. I knew I'd like the peppermint, but was surprised to find I LOVED the lime. It was so refreshing and silky smooth. Often I find fruit flavoured lip stuff to be sticky and overly sweet, but that is not the case here. A Special Offer for Who Can Stand Readers! For the next two weeks, when you buy 3 large soap bars, Alyssa will include 1 FREE guest bar of your choosing! 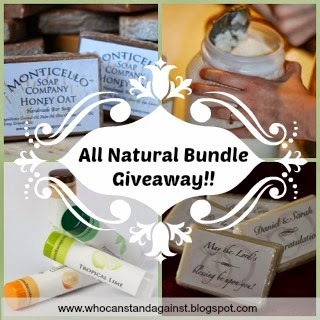 Just place your order online (not including the free guest bar), and send her an email at monticellosoapcompany@gmail.com with the subject line "whocanstand" and let her know your name, order number, and what scent guest bar you would like so she can include it with your order!